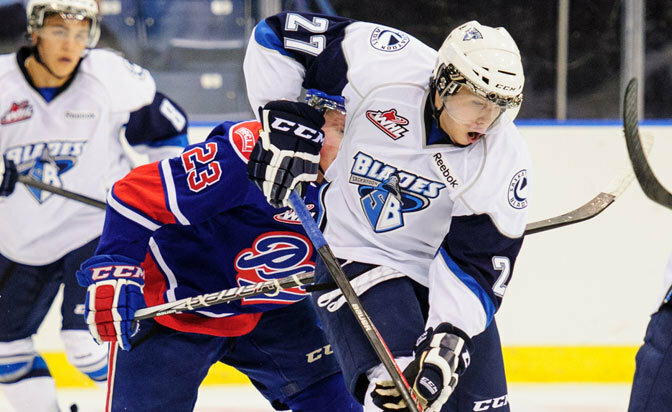 Saskatoon Blades general manager Lorne Molleken didn't have a lot to go on when it came time to making a decision on right wing Nikita Scherbak at the 2013 Canadian Hockey League Import Draft. "There weren't a whole lot of teams who saw him play, but the people I knew told me he was a skilled player and good skater," Molleken told NHL.com. "When I did my checking on him I received a lot of positive reports from NHL teams." Chalk one up for Molleken and his scouting staff. Turns out choosing Scherbak in the second round (No. 109) was an absolute steal for the Blades. While it took an entire training camp and preseason before he was given his official release from his team in Russia, Kapitan Stupino, Saskatoon coach Dave Struch soon realized it was worth the wait. "While we were in training camp and waiting for his papers to be finished so that he could join us on the ice, he sat in the players' box and rode a stationary bike while we practiced and played," Struch told NHL.com. "When he finally got his release, the coaching staff went to show him our systems and he showed us our systems. He picked up everything just from watching our practices and games." It might take time before Scherbak masters the English language, but he's been going to class and learning at an accelerated rate. "He's learning a lot more because he doesn't shut up now," Struch said. Scherbak leads the Blades in goals (17), assists (25), points (42) and plus/minus rating (plus-10) in 32 games. He's second with six power-play goals. "The best thing about him is that he's very coachable and teachable," Struch said. "Because he can skate he can get on the puck. But when he's not on it right away he's not afraid to make or take a hit. When you've got that part of a game from a Russian player it's exciting." The 6-foot, 172-pounder earned an A rating from NHL Central Scouting in its November players to watch list of prospects for the 2014 NHL Draft. Central Scouting's Peter Sullivan said he was surprised at how quickly Scherbak grasped the North American game. "When I watched him the first few games of the season he didn't know which way to go, but you could still see he had that high skill level," Sullivan told NHL.com. "When I went to scout Saskatoon a few weeks later I couldn't believe it was the same player; he was outstanding." Scherbak had no points and a minus-3 rating in his first two games. He'd make up for lost time in October, however, totaling 11 goals, 25 points and a plus-12 rating in 14 games. "He's a gifted skater. Gifted with the puck and his vision is really good," Struch said. "We're a gritty team so stops and starts are the key to our success. As a Russian player he's come a long way from the first five games. He's coming back into our zone and stopping and being sounder defensively. He's learning the North American way. "After talking to his agent [Vlad Shushkovsky], we figured it would take the full year to develop a more North American style to his game. But we've seen signs of it already which has helped our team." Struch had to think long and hard for the last time Saskatoon had a Russian having this much success as a rookie. It was during the 2005-06 season, when goalie Anton Khudobin went 23-13-2 with four shutouts, a 2.90 goals-against average and .917 save percentage. Khudobin was drafted by the Minnesota Wild in the seventh round (No. 206) of the 2004 draft and currently plays for the Carolina Hurricanes. "There's no doubt Nikita has been a big surprise for all of us, but I give all the credit in the world to the player for putting the time in and wanting to learn the game over here and being as coachable as he is," Struch said. "He doesn't always do the right thing, but he listens to us and wants to get better." In addition to his skill set, Sullivan said Scherbak has an edge to his game, and that only will bolster his draft stock. Struch said Scherbak can play center or right wing and work the point or play center on the power play. "At the start we were having a tough time putting him on the ice for the last 10 minutes of a game because he was a bit of a defensive liability," Struch said. "Now, when it's close or we have a lead we've given him a taste of that and he's succeeded." One thing is certain: Scherbak always finds the time to have some fun off the ice with his teammates. "In the big picture he's been a big part of our team and has been an unbelievable kid," Struch said. "He's a joker too, which is fun. He fits in really good with the players, but again, I go back to wanting to learn the language. He's put time into it and that can only help his linemates."